Upon seeing the driver lose control, the plaintiff changed into the second lane to avoid hitting the defendant driver’s car. The defendant hit the vehicle in front of him and then moved into the second lane, hitting the motorcyclist and dragging him across two additional lanes of traffic and the shoulder. The plaintiff argued that the defendant was driving negligently by speeding and not paying attention while the defendant argued that the plaintiff was negligent and claimed that he was tailgating the car when the accident happened. The motorcyclist suffered a hip fracture and blood clots that required surgery. The case initially proceeded through a 7-day trial. After 3 hours of deliberation, the jury found that the defendant was negligent and awarded the plaintiff economic damages totaling $298,577.67 and $900,000 in non-economic damages. Because of an error with the jury verdict form in which an instruction regarding comparative negligence was left out, the judge ordered a retrial on that issue alone. At the retrial, the motorcyclist was not found to have any comparative negligence for the accident. California allows a plaintiff to recover the percentage of damages that can be attributed to the defendant’s negligence through comparative negligence. Under this doctrine, a verdict will be reduced by the amount of the plaintiff’s own fault. This means that in many motorcycle accidents, defendants will contend that the motorcyclist contributed a portion of fault. If a defendant is successful, any resulting award will thus be lowered. For example, if a plaintiff is found to be 40 percent at fault while a defendant is found to be 60 percent at fault, the plaintiff will only be able to recover 60 percent of their damages from the verdict amount awarded by the jury. 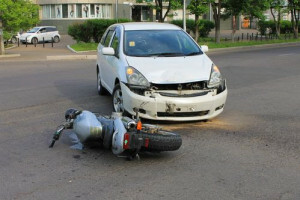 A plaintiff’s personal injury attorney may use experts in order to try to prove that the defendant is liable and that their client is not in a motorcycle accident, knowing that the defendant is likely to dispute liability in the case. If you or a loved one has been seriously injured in a motorcycle crash in California, contact a motorcycle accident attorney for a consultation about your case and the likelihood of your recovery of damages.